1. What or who inspired you to become a writer? My huge love of stories. I've devoured books ever since I was a small child, and I've always known I wanted to one day write a few of my own. Stories are as essential to me as food and air. 2. Your earlier releases were mainly historical fiction. What led you to write fantasy? A chance trip to the Metropolitan Museum of Art a few years ago, where I saw a wonderful exhibition of Alexander McQueen's work, which inspired a longing in me to write about the sea. That combined with a call from Disney - that came the very same day! - asking me if I'd like to work on a story idea with them that involved mermaids. 3. How challenging is it write this new series, as oppose to writing mystery or historical fiction? All writing is challenging to me. Grappling with a magical universe -- and the new way of thinking about rules and logic that it demands -- was particularly daunting. As was the world-building for the Waterfire Saga. But it was also a great deal of fun. And I was also able to very much bring my historian self to this project in coming up with a new origin story and mythology for the mer folk. 4. Did you feel any pressure to make Rogue Wave live up to the success of Deep Blue? I always feel a lot of pressure to produce a good story. I really want to engage the reader and surprise her and make her feel deeply for the characters and give her a sumptuous visual feast. Hopefully, I've succeeded! 5. Can you give readers a little tease into what Serafina and others will be facing in Rogue Wave? A deadly shipwreck ghost. A romantic surprise. And one seriously bad dude! 6. I noticed that there will be four books in the series. Do you have titles for books 3 & 4? The third book is DARK TIDE, and we're still working on a title for the fourth one. 7. Aside from writing, is there anything else you enjoy just as much? I love to spend time with my family, to ride my horse, and to scavenge for old and interesting things at garage sales and flea markets. 8. Thank you for taking the time, Jennifer. Please leave a message for aspiring writers. Never, never, never give up! No one can ever guarantee that you'll get published, but one person can guarantee you won't -- you. By quitting. So don't. Keep on writing. 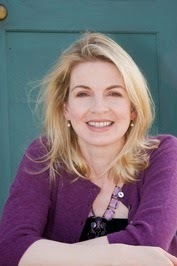 Jennifer Donnelly is the author of seven novels - Rogue Wave, Deep Blue, Revolution, A Northern Light, The Tea Rose, The Winter Rose and The Wild Rose - and Humble Pie, a picture book for children. She grew up in New York State, in Lewis and Westchester counties, and attended the University of Rochester where she majored in English Literature and European History. 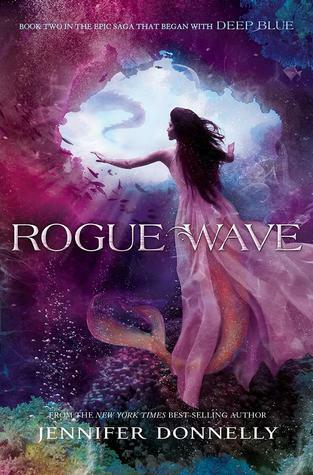 Win a copy of Rogue Wave. Open to US entrees only. That is a stunning book cover! The artist conveys a lot of the story in that painting as well. Good Luck to this Series!